Undeterred from my mess last night, I decided to try again this morning, mainly because I didn't use all the batter yesterday and I hated to waste it. Last night I tried finding some waffle-making tips online... I guess the main way to tell when the waffles are done is when the steam stops escaping from the iron. So, I took that advice---which meant my waffles this morning cooked longer than the ones last night---and they turned out much better! Yay! 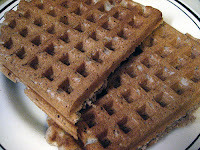 Now I definitely have more confidence to keep making waffles and to experiment with new recipes! Woooo!